Whistleblowers and the people and organisations that support them have been making waves and making news for decades. Finally, they’re making laws. Over the past two years, many countries throughout the world have passed new or strengthened existing laws to protect whistleblowers from retaliation, and to help ensure that their efforts to disclosure corruption, fraud and other crimes result in needed reforms. From Luxembourg to Vietnam, from South Korea to the US, and from Peru to Jamaica, countries in all regions of the world are granting new and expanded legal protections to people who expose a wide range of crimes. In many more countries – Australia, Canada, Colombia, Guatemala, India, Ireland, Lebanon, Nigeria, Pakistan and Taiwan, to name just a few – new or improved whistleblower protection laws are actively under consideration or being proposed. In just the first two months of a new US whistleblower programme, 334 people reported tips to government officials. The latest major breakthrough came in November, when US President Barack Obama signed into law the Whistleblower Protection Enhancement Act, which will provide new legal shields for federal employees – including protection for government scientists who challenge censorship, and for employees who challenge the consequences of the government’s policy decisions. Thirteen years in the making, this victory was pushed over the top thanks to an extraordinary grassroots campaign by the Government Accountability Project, the Project on Government Oversight and the public radio programme “On the Media”. And, last month, the European Commission – acknowledging input from TI and our friends at Public Concern at Work – passed new whistleblower guidelines for EU staff members, including a critical provision that requires managers to prove that any actions taken against employees were not motivated by whistleblowing. 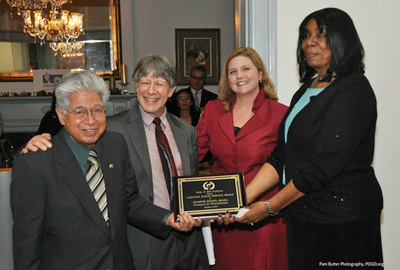 US Senator Daniel Akaka, who originally sponsored the US Whistleblower Protection Enhancement Act 13 years ago, receives the Lifetime Public Service Award from whistleblower activists (l-r) Tom Devine of the Government Accountability Project, Angela Canterbury of the Project on Government Oversight, and Marcel Reid of the Pacifica Foundation in Washington in December 2012. Why are whistleblower protection laws important? Without them, citizens can be fired, suspended, harassed or otherwise retaliated against for exposing wrongdoing. In extreme cases, they and their family members are threatened, beaten or even killed – as in the case of an Indian whistleblower named Lingaraju, who was hacked to death in front of his wife while they were fetching water near their home on November 20. Why are whistleblowers important? Worldwide, they have saved millions of lives, helped to recover billions of dollars in stolen and lost funds, saved precious environmental resources, and exposed all manner of cases of corruption, tax evasion, financial crimes and human rights violations gone undetected or ignored by official authorities. According to a 2012 survey by Ernst & Young, 40 percent of respondents worldwide identified whistleblowing as a highly effective tool for detecting wrongdoing. According to KPMG India, nearly 30 percent of all fraud detected in the country has surfaced due to the anonymous whistleblower. The oldest whistleblower law in the world – the US False Claims Act ­– has been credited with securing tens of billions of dollars in fines and stolen funds. An all-time record $4.9 billion in settlements and judgments was secured by the US Justice Department in 2012 under a whistleblower law that allows citizens to expose corruption and bring it to the attention of federal investigators. The figure topped the previous record by more than $1.7 billion, and brings total recoveries under the False Claims Act since 2009 to $13.3 billion – the largest four-year total in history, and more than a third of total recoveries since the law was amended in 1986. The international whistleblower movement is now at the point of no return. Activists around the world are demanding legal rights and protections for whistleblowers – and they’re winning in record numbers. As these protections expand, whistleblowers will have greater assurances that if they come forward and report wrongdoing, they will not suffer the consequence of committing the truth. ← The UN asks what we think – but will they listen?